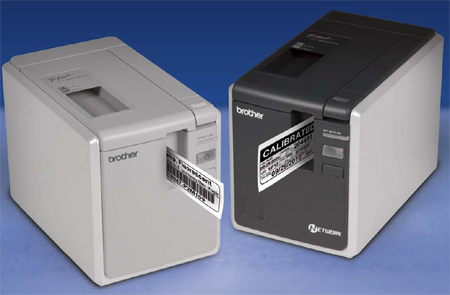 The Brother PT-9700PC and PT-9800PCN Desktop Barcode and Label Printers produce high-quality laminated labels suitable for harsh environment applications. With resolutions up to 360 x 720 dpi and a maximum print speed of 3.15 ips, the PT-9700PC and PT-9800PCN can be configured to print on demand, laminated labels that will fit many vertical market applications. The Brother PT-9700PC and PT-9800PCN Desktop Barcode and Label Printers produce high-quality laminated labels suitable for harsh environment applications. With resolutions up to 360 x 720 dpi and a maximum print speed of 3.15 ips, the PT-9700PC and PT-9800PCN can be configured to print on-demand, laminated labels that will fit many vertical market applications. The printers use thermal transfer technology and self-contained cassettes that include the adhesive-backed label and the lamination all in one. This drop-in cassette makes it easy to change consumables - there are no transfer ribbons to install and align, no need to remove wrinkles from a transfer ribbon, and no need to perform density calibrations at any time. The continuous label cassettes give you the flexibility to print labels of any length with a half-cut feature that allows multiple labels to be printed on a single strip and peeled off as needed. The powerful Brother P-touch® Editor label design software is included with each printer to help you design and print customized, on-demand labels for just about any application. You can create labels with text, graphics, and over 14 industrystandard linear and 2D bar codes. In addition, you can use P-touch Editor to connect to and print labels from a variety of data files, includes text and CSV files, Excel® spreadsheets, and Microsoft® Access® and SQL Server® databases. A special feature with the PT-9700PC and PT-9800PCN printers is that large label print jobs can be distributed among multiple printers simultaneously. The number of labels to be printed will be automatically divided among the selected printers. Using this distributed printing mode will reduce the total printing time and reduce overall throughput. Distributed printing is available via the USB and Ethernet (PT-9800PCN) interfaces.